OK WordPress was updating itself, themes or plugins and something went wrong and now your WordPress site is stuck in Maintenance Mode with a message on the screen that reads ““Briefly unavailable for scheduled maintenance. Check back in a minute.” and you can not get into your wp-admin or view your site. Learn how to get out of Maintenance Mode when WordPress gets stuck. Follow these steps to quickly solve the issue. 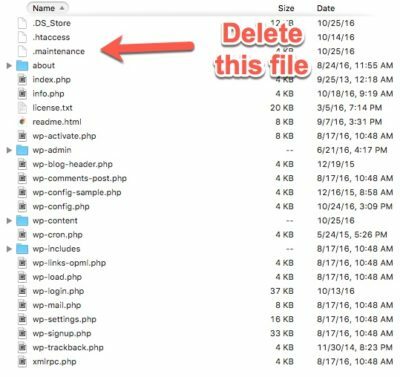 FTP into your WordPress site and look for a file called .maintenance in the WordPress root. (If you do not see this file make sure to adjust your setting in your ftp client and make hidden files visible. That’s it! WordPress should now be back to normal and serving your regular site. One thought on "WordPress Stuck In Maintenance Mode"